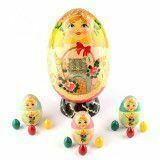 We offer the widest selection of authentic Russian Nesting Dolls available online. 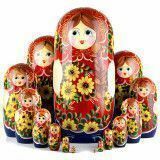 These dolls are commonly called Russian Dolls, Stacking Dolls, Matryoshka, and Babushka Dolls. They are known as symbols of maternity, continuity, layers of personality, and of Russia itself. Our nesting dolls are a unique Russian gift, toy, or home decoration. From adorable animal nesting dolls to popular fairy tale dolls, to even miniature nesting dolls, we have the best selection around! A traditional feel, with a modern appeal, our nested dolls are sure to put a smile on anyone's face. 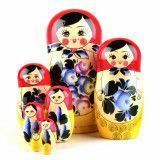 Here at The Russian Store we offer our vast selection of imported babushka dolls ranging from classical to modern with many themes to choose from. 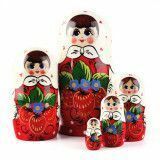 Our best sellers are the “Red Roses” line of traditional Russian nesting dolls also known as Semenov style matryoshka dolls. These come in a variety of sizes from 3 piece sets to 30 piece sets. These classic designs have stood the test of time thanks in part to the conventional wisdom of those who have come before us. The ideas and customs that created these dolls are uniquely Russian, but you don’t have to be Russian to enjoy these cute stackable dolls. Typically there are no words on these nesting dolls; the ideas and themes are meant to be universally understood. The simple charm that a nesting doll provides can transcend any culture. It is customary for Russian folk art artists to decorate their dolls with bright colors and smiling faces. No matter what language you speak you are sure to understand where the artist was coming from. The artists do not need to use any words, they let their art speak for itself, and people usually get it. In addition, traditional matryoshka dolls are meant to celebrate traditional Russian culture, and it is customary to show the subject of the nesting doll wearing some sort of traditional clothing. Sometimes they are wearing Russian hats, but more often the dolls that feature women often show them wearing a traditional Russian shawl. Food and drink are also common themes in traditional babushka dolls. When you browse our collection of traditional dolls you will see many depictions of women with either bread or tea in their hands. Russia has a deep rooted tradition of taking care of guests. If you are ever a guest in a Russian home they will not let you leave until your belly is full. Hospitality is a major pillar of this culture, and it still lives on today. Many homes will have a samovar (tea pot) and guests will always be offered tea. The bottom line is that nesting doll are meant to be played with and enjoyed. Even if you are just opening the doll to displaying it on your mantle, you still must actively pay attention to how each doll lines up. Don’t press too hard or you’ll break it. Don’t open it too fast or you’ll lose that little one. Take your time. Be careful. Have fun, and enjoy your nesting doll just as people have been enjoying their nesting dolls for over a hundred years. These customary, time honored designs make a perfect gift, or addition to a collection. They are all handcrafted, and individually unique. Our collection of fine floral matryoshka dolls is undoubtedly one of the most expansive collections ever offered to the public online. We bring to you over 50 different flower nesting dolls. Each one of these dolls is unique in its own way. You will have a hard time trying to find dolls like ours anywhere else. Each doll features a hand painted woman or girl with a floral theme throughout. Artists have been painting flowers on stacking dolls for over a hundred years now, but that does not mean that our dolls are outdated. These classic themes have been given a modern twist to create a true work of art that is sure to be cherished for generations to come. Flowers, bright colors, and smiling faces; how could you go wrong? The best part about these dolls is the colors. Bright, vibrant colors cover each and every one of these dolls. Every doll is painted all the way around. Sometimes the back of the doll is even more impressive and colorful than the front of the doll. The paintings are very detailed. Every time I look at these cute little dolls I get a warm feeling in my tummy. They are just that adorable. 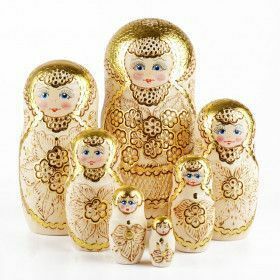 Nesting dolls have a rare appeal in that they are widely recognized, and identified, but they still have a novel, and unique charm, almost a cult status. This makes nesting dolls the perfect decoration that would catch someone’s eye, receive compliments, and genuinely create a more unique, cozy, at home feel, without having the adverse effects of a cluttered shelf full of knick knacks. These dolls are the perfect way to add just a touch of creativity, and a cultural flair to any decor. The floral style of these nesting dolls is especially popular as a piece of home decoration since the bouquet of colorful flowers is the perfect universal touch to any room. These wooden dolls are perfect to add just a splash of color, or a cute and charming centerpiece for a dinette set. Even if it’s just sitting on the shelf, carefully watching over the house, it’s sure to be one of those subtle touches that makes your home more unique without looking tacky. Bring your own authentic floral Russian nesting doll home with you today. By population, Christianity is still the most popular religion in Russia, but this is a mix of modern American Christianity and eastern orthodox practices. Over 100 million Russian citizens consider themselves to be Orthodox Christian. There are also anywhere from 7-20 million people living in Russia who practice Islam, and there are approximately 3-5 million Muslims living in Russia. Buddhism and Judaism are the other two major religions that fill Russia. We realize the importance of religion in life, and we have compiled a fine collection of religious nesting dolls to allow our customers to show their faith with unique style. Most of our religious nesting dolls are Christian themed. We have many babushka dolls that depict the birth of Jesus Christ. We also have many babushka dolls that show baby Jesus being held by his mother Mary. Some of our dolls are in the traditional Russian icon theme, and this may be more acceptable to an Orthodox Christian. If you have ever been inside of an orthodox home you would notice that there is at least one icon of Jesus hanging somewhere on the wall. Religious art is a big part of Russian life and culture, and it has been this way for thousands of years. No matter what religion you are, there is no denying the power that certain works of art have. Celebrate the life, teaching, and sacrifice of Jesus with one of our beautiful nesting dolls. 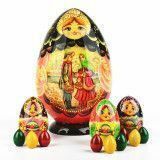 These matryoshka dolls make the perfect gift for Christmas, Easter, a baptism, wedding, or other religious event. Mark each milestone with something that will be cherished for years to come. Religion never goes out of style. This collection is without a doubt the most detailed and intricate that we offer when it comes to the quality of the paintings. Each doll is painted by hand, and many of these dolls are signed by the artist. Aside from the Russian artist’s name, there is usually no Russian on the dolls. Each artist paints to be understood by everyone no matter how many pieces the doll may be. Some dolls are only 5 pieces, while some other dolls are 20 or more pieces. In either case, the artist is conveying the entire fairytale throughout each doll. You can literally tell the story as you open the dolls, each smaller doll is another chapter in the story. Many of these classical Russian folktales are similar to American fairytales, and in some cases they are exactly the same. Take for example the Russian story of Masha and the Bear. In this tale, a young girl named Masha wanders off into the forest and finds an empty home. Her curiosity gets the best of her, and Masha ends up going inside the house. Once inside Masha eats some food, tries on some clothes, and eventually falls asleep in one of the beds. When the owners of the house, who happen to be bears, return they are not very pleased to find Masha in their bed uninvited. Does this sound familiar? It’s essentially the same story as Goldilocks and the Three Bears in popular American culture. 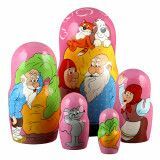 We also have nesting dolls that tell the story of Little Red Riding Hood, and Morozko (Father Winter). You might have also heard of “Puss in Boots” from the popular children’s movie “Shrek”, and our Cinderella nesting dolls are often difficult to keep in stock. Not all of our Russian fairytale nesting dolls have an American equivalent however. Many of our dolls are uniquely Russian, but this does not mean that you cannot enjoy them just the same. We have provided for our customers a comprehensive listing of all of the Russian fairytales that we carry. You won’t hear a story quite like the Tsar Saltan in America, but it is an amazing story, and we have several amazing nesting dolls that tell the story. Please browse our library of Russian folk tales and see which one you like the best. Perhaps it’s The Great Turnip, Snow Princess, Spotted Hen, Golden Cockerel, or even the story of Ivan Tsarevich. Some of our dolls show scenes from different fairy tales as a sort of compilation of tales. The most popular fairytale nesting doll in Russian homes is probably the Golden Cockerel nesting doll. The Golden Cockerel was originally a poem written in 1834 by Russian author Alexander Sergeyevich Pushkin. In Moscow in 1909 Nikolay Rimsky-Korsakov adapted this poem for an opera and people still perform it today all around the world. Find this fairytale and others in our nesting dolls , our Russian lacquer boxes, and in our collection of fairy tale books! There is a story that has been told that one of the first nesting dolls ever created had a beautifully drawn picture of a hen on it. The original nesting doll depicted a traditional peasant woman holding the hen in fact. This age-old tradition of decorating wooden nesting dolls with animals still lives on today, and we love to celebrate this tradition with our collection of amazing animal nesting dolls. After decades of ingenuity, and creativity, the animal motif is still not only present in the nesting doll community, but it is thriving. Some of our most popular stackable dolls feature depictions, representations, and illustrations of animals of all sorts, whether in a charming and colorful cartoon, or an actual portrait, there’s an animal doll for everyone out there. What makes our animal babushka dolls so unique and different from the pages and pages of other nesting dolls out there? Our commitment to quality is what sets us apart and what keeps our loyal clientele base coming back year after year. We are dedicated to bringing you only the highest quality products for affordable prices. Nesting dolls have been around since about 1890, and after so many years, some artists are starting to think outside of the box. There are a handful of standard nesting doll shapes out there, but when the master artisans from Russian who craft our nesting dolls get a creative urge, they really make some interesting products. The animal dolls are a great way to show of the individual, small little touches, that make each nesting doll unique. The three dimensional ears on our pig dolls are a great example, why paint ears on, when crafting them out of wood makes the doll that much more appealing. We also feature penguin nesting dolls with beaks that jut out, and cats with three dimensional ears. It’s a subtle spin that really adds a lot of character to the animal illustrations. The most common theme in Russian folk art is that of animals with human expressions. In an area with a harsh climate such as Russia, this may be one way to illustrate to people that we’re a part of nature just like the animals. Moreover, craftsman might have just been looking for a reason to create an adorable nesting doll of a cat playing the balalaika. It could be both, because these dolls are both excellent examples of folk art, and simply charming. 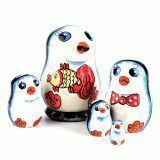 Whether it’s papa cat, dressed in his Russian hat, watching after his little kittens, or a penguin sharply dressed in a top hat, and a bow tie, these Russian stackable nesting dolls are a great gift that’s not soon to be forgotten. We have a large selection of puppy and dog nested dolls! 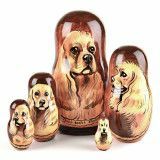 Each nesting doll features a different portrait of a particular variety of dog, and each doll is signed by the artist. Unfortunately you can’t play fetch with the dolls, but hey, at least they won’t chew up your sneakers! Whether you just want to give a gift to someone who has the personality of a certain dog, or a gift to the owner of a certain dog, or if you’re just looking for a unique, and charming little work of art to show off your love of canines, our imported nesting dolls would make a fantastic conversation piece to be admired for years to come. Many of the Russian renditions of American made animation is not exactly spot-on. Our buyers are constantly on the lookout for original accurate yet artistic depictions of your favorite American characters. Our Mickey Mouse nesting dolls are some of our best sellers. You simply cannot go wrong with these classic animated characters. We do have some overlap here with animated characters that are also fairytale such as Peter Pan, Cinderella, and Snow White. We also carry some more modern characters such as Dora the Explorer Matryoshka doll, and the more adult-themed South Park nesting doll. These dolls are not just for kids, although we are sure that kids will love them, but they are also for collectors. You know your friend who has everything Winnie the Pooh, Raggedy Ann, or Betty Boop, well I bet they don’t have a nesting doll of their favorite character. These dolls make perfect gifts for that person who has everything. Give them a classical gift with a modern twist on it. What a conversation piece. You have a Wizard of OZ nesting doll? No way! Where did you get that? That’s awesome. These stories and characters are known the world over, and we have captured their charm in nesting doll form. This is the absolute perfect gift for that sports nut in your family or circle of friends. Each doll is hand carved and hand painted. Have you ever seen anything like these in stores? If you have we would like to hear about it. The fact of the matter is that these dolls are extremely rare. Most of the dolls that we have today were specially made at our request just for our customers. With teams changing each and every year it is difficult for artists to keep up with the times, and therefore they usually do not even attempt to create these dolls. In addition, it is very difficult to get the faces just right. When we send in our orders for these sports dolls we include several face pictures of each player we want represented. Sometimes we get the dolls back and the faces do not look right, but most of the time our artists are spot-on. This is a tough skill though, as each doll is painted by hand with the help of no machines or stencils; it’s all freehand. If the artists messes up on the any one of the five players faces, he or she must start the entire process over again. Each doll features the likeness and number of one athlete. Because of this, some of our dolls currently online might be a little outdated. For example, Jay Cutler no longer plays for the Denver Broncos, he plays for the Chicago Bears now. Any diehard Broncos fan would remember the Cutler years though, and is sure to still appreciate this unique nesting doll set. Also, the largest doll is often a representation of an athlete who leads the team either by position like a quarterback or pitcher or through experience and hard work like a team captain. Remember when bobble head dolls took over major league sports in America for a while? 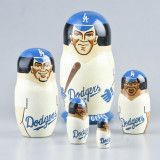 Well, we are trying to start the next big sports memorabilia fad: nesting dolls. 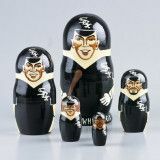 Wouldn’t you love to go to your favorite ballpark on a nice summer night when its nesting doll night. Way better than free hot dog night, am I right? Winter is big in Russia, and when we say big we mean huge. Most of Russia’s interior would fall into the subarctic region when discussing climate. This means that aside from the coastal regions, there are really only two seasons, winter and summer. The shoulder seasons are lost due in part to long harsh winters. In places like Siberia it can reach -90 degrees Fahrenheit in the dead of winter. While temperatures that low might not be fun, Russia is known for not letting the constant cold and snow get its people down. People all around the world have fun in the snow, but in Russia is seems to be a way of life for many. On any given frigid day you are likely to see bundled up children running around with their parents in the cold either sledding, building a snowman, or even riding in a Troika (open sleigh pulled by three horses). A harsh winter is no reason to stop what goes on in life; at least this is the policy in Russia. In America you will often see snow days and people staying inside a lot when it gets cold outside; not in Russia though. Winter is welcomed with open arms here, and people who cannot take it usually move away. Russian people realize the necessity of winter. It brings them the snow pack that will melt and provide water to their crops all throughout the next summer. So even though it may be unbearable to some, most Russians just cuddle up and settle in with a big smile on their face when winter hits. Our collection of winter fun nesting dolls is meant to represent this respect that Russian people have for the season. Each of these dolls has been hand painted especially for our customers here at our online store. Each doll shows a family of sorts having a great time in the snow. We have also included in this line a few Christmas nesting dolls that show Santa clause, because, well Santa is associated with winter all around the world thanks in part to American marketing. Winter comes every year whether you like it or now. Celebrate the winter season today with one of our fine nesting dolls, and cuddle up with our authentic Posad wool shawls. They say that imitation is the highest form of flattering, and this exclusive line of celebrity nesting dolls is no exception. 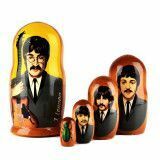 Our buyers have been working very closely with our nesting doll artists in Russia over the past several years on developing a collection of nesting dolls inspired by famous American personalities. Dolls like these are very popular in Russia, and we do carry those traditional dolls as well. We have the Tsars and we have famous Russian paintings which are breathtaking. In addition to the traditional Russian themes, we are excited to be branching out into selling original artistic renditions of famous American icons. From Elvis to George Bush Jr. to the Beatles we have got them all and we are constantly on the lookout for new designs that are up to our standards. We often encounter similar dolls sold by other companies that do not even come near the accuracy and detail that our dolls display. There is nothing worse than a poor rendition of someone that you have seen thousands of times on the television. Take home a Michael Jackson nesting doll today, or maybe even a Miss Marilyn Monroe Matryoshka doll. The architecture of the buildings, the smells of the foods, and cut of the casual clothes, you know when you are in Russia just by walking down the street. Some of these things have transcended into popular American culture even. Any American person would recognize a picture of Saint Basil’s Cathedral as positively Russian even though they might not know anything else about it. We have many dolls that display famous Russian architecture. There is nothing quite like it in the world; slightly European and slightly Asian in inspiration, the style that defines Russian architecture is truly unique to Russia alone. 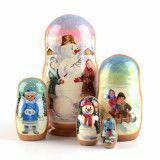 Here we love to celebrate the past while honoring the future, therefore we have compiled for our customers a special line of Russian art and culture nesting dolls. These dolls have been inspired by people and events that are Russian, but that have gained a worldwide audience. Did you know that The Nutcracker ballet was composed by a Russian composer named Pyotr Ilyich Tchaikovsky. We have several dolls to commemorate this gift to the world. 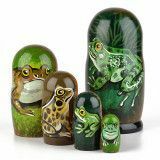 We also have several larger more expensive nesting dolls that feature a collection of art from specific Russian artists that painted traditional works with oil paints on canvas. These painters worked in the old country for the Tsar families. They were often commissioned to draw elaborate scenes from Russian history. Today, these works hang in museums all around the world. Artists such as Boris Kustodiev painted in traditional style while creating new classics in their own right. The scale of these dolls are too small for those under the age of 10, so they are best for mature children, adults, collectors, and enthusiasts of nesting dolls. They make fun stocking stuffers, cool Easter basket “eggs,” and special “just because” surprise gifts. Sometimes their tiny size makes them a little difficult to open. Here’s the easy way: Squeeze gently on the seam of the two halves of the doll. This will create a small opening in a center of the doll, where you can put your fingernail in to prop it open. Continue with this squeezing technique until you open the last doll.